Dr. Colman L. Elliott is a native of Brooklyn, NY. He accepted Jesus Christ as his personal Savior at the age of 12. He has a great devotion for teaching and winning souls to the Lord even at a young age. It was at Mt. Pisgah Baptist church in Brooklyn, NY where he was called to the ministry at the age of 25 in 1975. He ministered in the prisons, detention centers and nursing homes. He was a youth leader and Bible school teacher at God’s Watchtower of Prayer in Brooklyn, NY. Dr. Colman attended Tabernacle of Prayer under the auspices of Apostle Johnnie Washington; he also attended Tabernacle of Prayer Bible Institute. He was a youth pastor and Sunday school teacher at Brooklyn Tabernacle Deliverance Center under the late pastor Dr. C.R. Johnson. Colman also enjoyed teaching at Community Bible Institute. He received the Bachelors of Religious Education B.R.E. from Lighthouse Christian College in conjunction with Community Bible Institute. 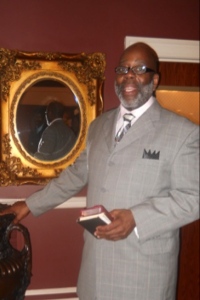 Dr. Colman relocated to Richmond Virginia and became a youth pastor at Community Church of God in Christ. He ministered at the detention centers in Richmond and co-host a weekly radio broadcast with Dr. Inneta Hayward, “Studies in the Word”. Pastor Colman received a Doctor of Christian Philosophy, PhD from Shekinah School of Ministry. He served as overseer of the youth department and pastor of the ministerial staff of Inner Court Family Worship Center under the pastorate of Bishop-elect Carlos Reyes. Dr. Colman is President of Circle of Truth School of Ministry; a teaching and intercessory ministry. Dr. Colman serves with integrity and excellence in the service of Jehovah, shalom.